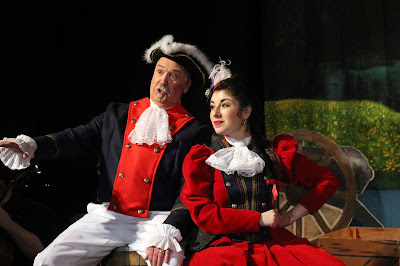 [Last] weekend the Light Opera of New Jersey [presented] Gaetano Donizetti’s two- act comic opera The Daughter of the Regiment. It is the second production of its 23rd Season of operetta and musical theatre. This is a marvelous, fun event presented in English; ”fun” is clearly the correct word to describe this screwball musical eye and ear treat. During the entire two-hour presentation last night (the first of only two!) it was difficult to determine who was having more fun…the marvelous cast or the audience with their energetic applause and laughter. This is the perfect vehicle to provide a star turn for the returning Chelsea Friedlander (above, with David Murray), a LONJ favorite who has spent the past year making multiple well-received debuts across the country. Chelsea does not disappoint…she is a pure delight as the tomboy ‘mascot’ of a French regiment circa 1830. She does it all…sings (beautifully, of course), dances, and acts (from tender to broad slapstick). Chelsea plays Marie, who was found on a battlefield just after being born and raised by an entire French Regiment who love her as their own daughter. Her life however is changed forever when she is saved from a fall by the heroic peasant boy Tonio (played impressively by Ivan Rivera who sings the opera’s most famous and insanely difficult aria (Ah, mes amis…Pour mon ame) in English. It is his proclamation of his love and faithfulness to Marie. Her life is further altered by the arrival of a local Marquise with her manservant Hortensius. 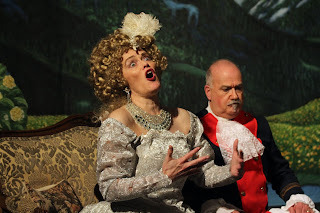 Playing the Marquise, to comic perfection, is Hanne Dollase (left, with David Murray) with her regal bearing and distinctive contralto voice. Straight from a Marx Brothers slapstick romp is James Smith as the always impertinent Hortensius. James is a comedy delight. David Murray has his own star-turn as Marie’s father-figure, Sergeant Sulpice. This rich baritone voiced opera veteran adds a fine luster to the proceedings. Supporting cast members: Beth Gleason; Elaine Gennaro; Laura A. Defelice; Joanna Hoty Russell; Jordan Wilhelm, Mike Baruffi, Zachary Morehouse, Frank Skokan, Will Roper, Rick Morley, and John Lamb as members of the regiment. Members of Central Jersey Symphony are Evelyn Estava; Cristopher Basso; Kevin Kostiw; James Celestino; Sara Berger; Lisa Nettleship; Nancy Vanderslice; Andrew Silbert; Taylor Goodson; and Karen Kelland. Principal creative credits: producer-Bill Corson; director- Jamie Baer Peterson and Lauran Corson with musical director- Michael Avagliano; stage manager-Amy Liu; costumes-Patty Hibbert; wigs- Beth Gleason; scenic artists-Tim and Mindy Lynch; lighting-Diane Giangreco; set design-Jerry Moses; props-Mindy Lynch.